VALENTIJN -Nieuwe Kaart van Choromandel ende Malabar..
VALENTIJN,F. - Nieuwe Kaart van Choromandel ende Malabar..
Nieuwe Kaart van Choromandel ende Malabar.. - VALENTIJN,F. Size : 19.9 x 23.0 inches. / 50.5 x 58.5 cm. 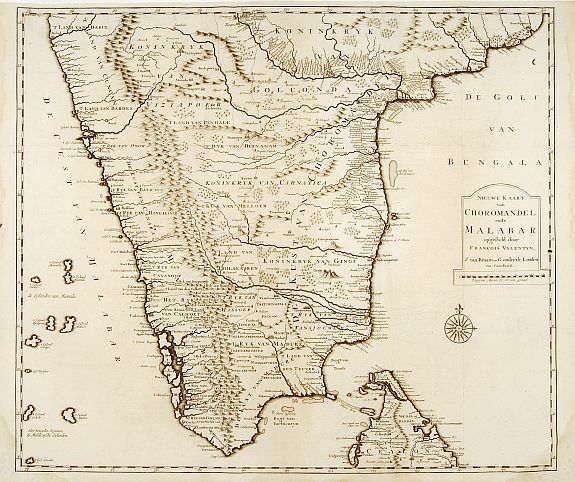 Description :"Fine chart depicting the southern part of India and the northern tip of Ceylon. Much detail is given along the coastlines, settlements and principal coastal features are identified. An attractive early map, one of the few early Dutch maps to focus on the region. Françcois Valentijn (1666-1727), a missionary, worked at Amboina from 1684 to 1694 and 1705 to 1713 and travelled extensively in the VOC's lands. He is best known for his monumental history and description, ''Oud en Nieuw Oost-Indiën'' which remains one of the most important primary sources for the East Indies and neighbouring lands." Condition : Folds as issued. Dark impression. Some light staining in lower margin, hardly affecting engraved area.